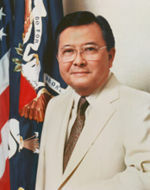 Daniel Ken Inouye, (September 7, 1924 – December 17, 2012)  was a Senator from Hawaii from 1963 until his death in 2012. He also was a member of the House of Representatives (1959-1963), a State Senator (1958-1959), and the Majority Leader in the Hawaii House of Representatives (1954-1958). In March 1943, 18-year-old Dan Inouye, then a freshman in pre-medical studies at the University of Hawaii, enlisted in the U.S. Army's 442nd Regimental Combat Team, and was soon promoted to the rank of Sergeant. He lost his right arm in combat and on May 27, 1947, he was honorably discharged and returned home as a Captain with a Distinguished Service Cross (the second highest award for military valor), Bronze Star, Purple Heart with cluster and 12 other medals and citations. His Distinguished Service Cross was recently upgraded to a Medal of Honor, the nation's highest award for military valor. He received that medal from the President of the United States on June 21, 2000. Inouye has earned the moniker "King of Earmarks" on capitol hill for his steadfast support of earmarks and inefficient big-government porkbarrel spending. Daniel married Irene Hirano Inouye in 2008. Irene is Chair of the Board of Trustees for the Ford Foundation, one of the largest foundations in the world. His previous wife of close to 60 years died in 2006.